If one of your goals for 2015 is to update the look of your kitchen and increase the value of your home, you should consider upgrading with granite – not just for your countertops, but for your kitchen island. Granite is becoming the go-to surface for kitchen and bathroom countertops because it is both sturdy and stylish. It can hold up to the everyday wear and tear that your family puts it through and still look stunning and stylish for guests. 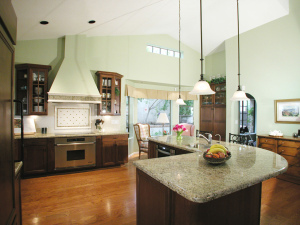 Kitchen islands are increasingly the gathering place and sometimes the dining area for families on the go. That’s why they need to be able to resist scratches, stains and heat just as much as your kitchen countertops do. It is easy to keep granite surfaces clean and looking like new by simply wiping them off with soap and water. Designer Cabinets, Granite & Tile is proud to be the largest fabricator and installer of high quality granite products in Northeast Ohio. At our 4000-square-foot Bedford Heights showroom on Richmond Road, you can look through our extensive selection of handcrafted granite slabs. One of our design consultants will help you choose the exact slab from which your kitchen island countertop will be crafted. While you’re there, you may even get inspiration for some other home countertop and flooring ideas. Your granite kitchen countertop will be cut to fit your island by our experienced fabricators and installed by our team. Our professional design team will work with you through each step to help ensure that everything is done to your satisfaction. We know that any type of home renovation is a big step. Granite kitchen countertops are not an inexpensive investment to make in your home, but when done right, it is a worthwhile one. Our team is available six days a week to answer any questions you may have. Feel free to give us a call at 216-245-4522. You can also complete our brief online form, and we will get in touch with you as soon as possible. We’re here to help give you the kitchen of your dreams.